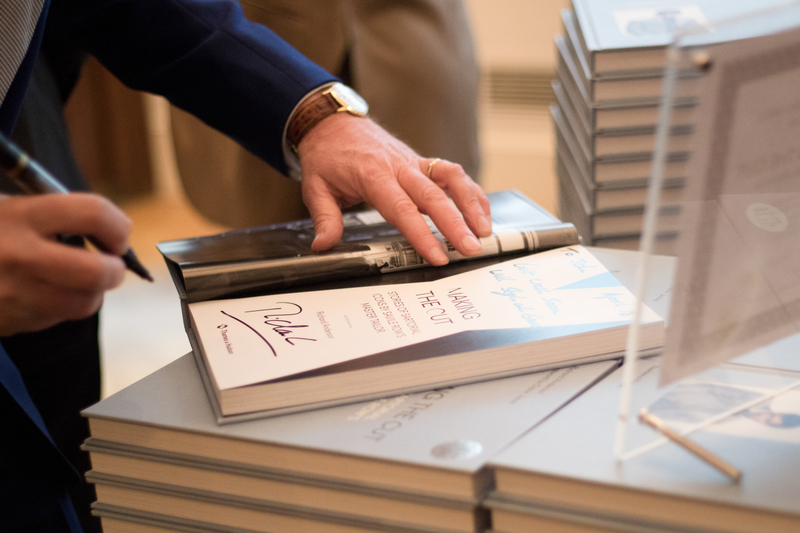 Last night, friends, family and press gathered at 13 Savile Row to celebrate the launch of Savile Row stalwart Richard Anderson’s second book – Making The Cut. Richard’s second book “Making the Cut” introduces the traditional craft of cutting a bespoke suit and garments, showcasing twenty-five classic menswear designs that have been creatively adapted in new and unusual ways for the modern gentleman. Each piece has its own story from a rakish red and white seersucker coat to a show-stopping black sequined dinner jacket, and explores the fascinating history of the diverse fabrics and cuts. Original sketches, patterns and photographs reveal the time, dedication and precision that go into creating a truly custom-made piece throughout the book. It is divided into five sections – Light Fare, Strong Suits, Atypical Tweeds, Top Coats and Regalia Redux. Richard likes to refer to it as a bible of sartorial know-how that will inspire anyone looking to commission a bespoke garment of their own.